Anna: Many of my clients have bred their horses for the quantity of swirls in support of performance and otherwise… its a fun subject and can certainly keep you safe when you meet them for the very first time giving you great insights. Kay: I just located this one from when I first got her. Think it might be adequate…. Anna: Very interesting, Kay Tomlinson, and not your usual swirl that I have seen. 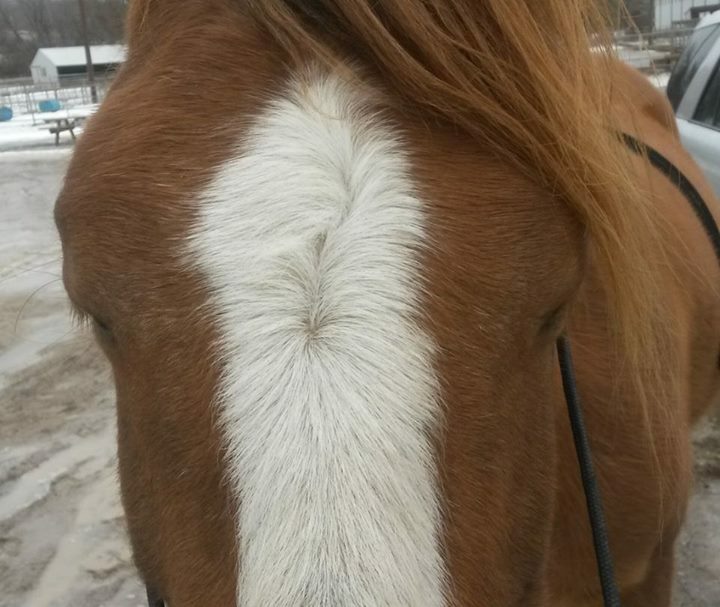 If I am identifying this correctly the swirl lies slightly to the left also making her left side dominant and so I would teach her on the left side first, not because its standard, but because she would benefit from that side more. Equally, if she has a bad experience on this side, it would show up quickly. I have found that individuals with a “wheat sheaf” swirl (elongated) do not tolerate fools and prefer information to be clear and precise. They are often misunderstood and can find themselves in difficult circumstances often being sold on multiple occasions. When the information is not correctly presented, they are known to have a short fuse and will often “act out” sometimes this causes major behavior issues and as a horse whisperer I find myself involved to not only save lives, but act as messenger on their behalf. They appreciate clear messages the first time around with consistency, recognition for their character, strength and knowledge. Bring in the sensitivity of the chestnut you will be required to be a great leader honoring the herd of two:)! Hope this helps, as it certainly helps me when I meet horses for the first time and have to be at liberty with them. Often I only have 1 hour to “fix” a behavior and I thread my knowledge in for support and safety for sure. If you are asking where this information is coming from, my point of reference is my knowledge and experience, not documented other than in my head:) at this time and only once did I create a webinar piece on it…more documentation is yet to come:). Kay: Thank you, Anna! Yes–very helpful. Nevada is scary-smart, and insists on clarity and respect in communication. She does have a short fuse, but fortunately her acting out involves mostly a refusal to interact the next day, once you’ve insulted her or her intelligence. She’s the most intuitive and communicative of my horses, in terms of understanding human “issues” (equine-guided learning is our job). Much more than the other two horses, Nevada has facilitated some major breakthroughs for my clients, in extremely creative ways. Thanks for your additional insight! Next postAnna is coming to Friends of Horses in April! See what else is going on at Friends of Horses Rescue! Love nuggets like this Anna. Thank you for posting. You mentioned something that sparked a question. You said bringing in the sensitivity of the Chestnut. Is there a common trait of Chestnuts? 🙂 Thanks! Chestnuts are known to have a more sensitive skin type :), coupled with mares, it can make for an interesting combination on times! So interesting–Nevada has a lot of skin issues that we are trying hard to overcome. Didn’t realize that sensitivity was a characteristic of “redheads.” True in our case!